Lock in a great price for Virginia – rated 9.6 by recent guests! Lovely host, very much willing to help & always with a smile:) The food is outstanding and the rooms are super cozy. Loved our stay here. Has a very rustical feel to it. Highly recommended!! We all loved staying there. Virginia, the hostess, even went out of her way to help us with everything the baby needed! Don't forget to try some alevropita with your breakfast :). As always, Virginia's place surpassed expectations. 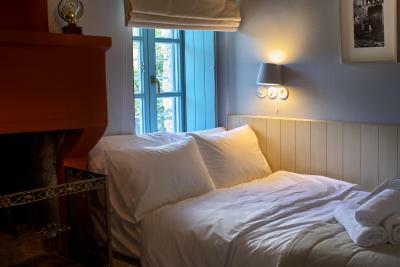 The charm of the renovated interiors is surpassed only by the friendliness and helpfulness of the hosts. 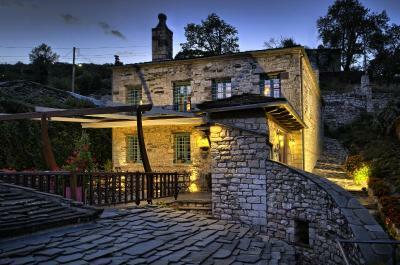 This place is comfortable, beautiful and well-situated to explore the Zagoria region. 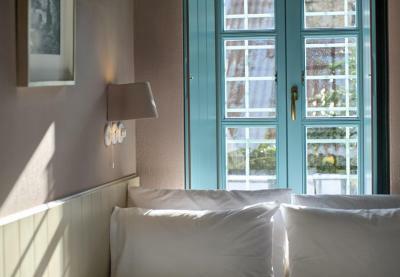 This has been our aecond stay at Virginia's charming hotel and we have fallen in love with the place. Virginia is a fantastic host and the hotel is beautiful, filled with amazing details and located in amazing nature. We can't wait to come again. Virginia was great. Arriving at 9pm she gave us a very friendly welcome and we had a lovely meal next to her fire. She gave good recommendations on where to visit in our short stay in the region. Lovely breakfast too. Very nice establishment, respects the local architecture and offers a cozy and warm accommodation. 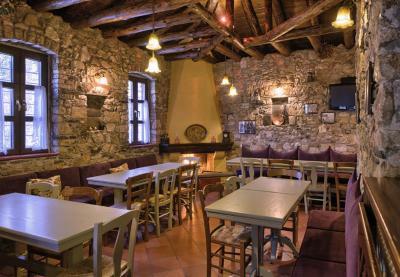 The location is ideal for visiting the Zagorochoria as it is very close to all the roads driving to the various villages. 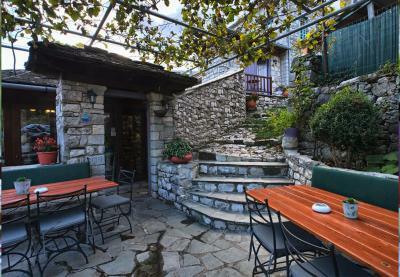 You can easily visit Ioannina which is only 1/2 an hour drive. Virginia is the best hostess, very friendly and ready to answer all your requests. Don't miss the restaurant of the hotel which is one of the best in the area and is very reasonably priced. All in all we enjoyed very much our stay there and we will definitively stay there in the future. A nice surprise in this village of zagorohoria, a family business well organised! 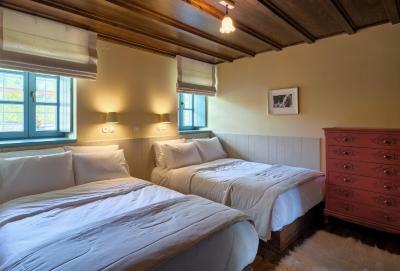 Beautiful design combining traditional and modern decor, very clean rooms and restaurant and great value for money! Brijinia and her family are the perfect host's, so welcoming and helpfull. 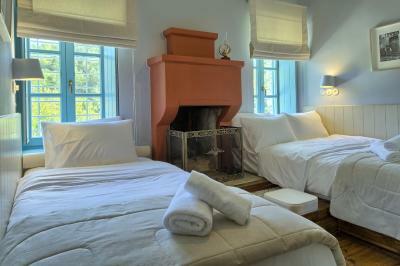 the rooms are small and cozy' beutfully decorated, the most comfortable bad's we slept on in greece. breakfast is good, dinner was delishious. and the sinery of the resturant is lovely. yassu beijinia!!! 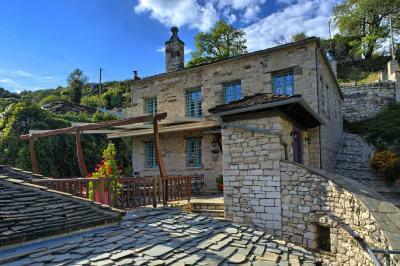 Virginia is tucked away in a tiny mountain hamlet in Epirus. So peaceful and quiet after the hustle and bustle of Ioannina. 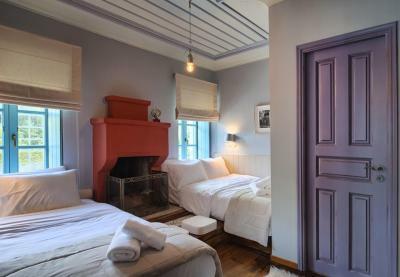 The room was the best ever in Greece and I (and my son) visited Greece like for 20 years! The tasteful interior styling, the beds were so comfortable, you were sorry to get up. Everything was thought of, every little detail. The homemade spinach pie to die for, the lavish breakfast, the kind host Virginia. I will certainly pass on this accommodation to my friends and family and would recommend it to anyone who reads this. 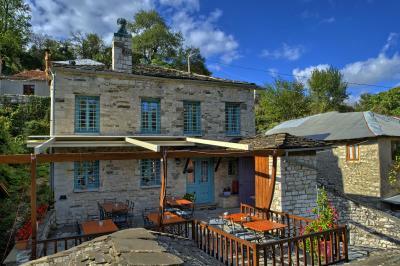 Offering a traditional restaurant and free bikes, the stone Virginia is located in the mountain village of Aspraggeli. 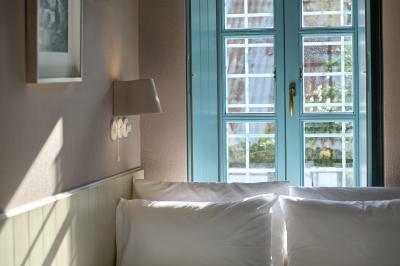 An outdoor sun terrace is available for relaxing moments. Free WiFi is provided in the public areas. 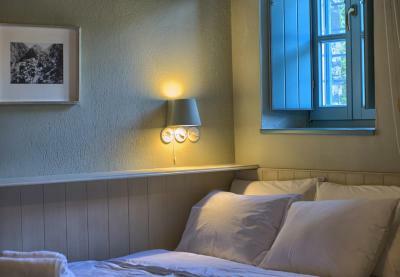 Fitted with beamed ceilings and wooden floors, all rooms at Virginia come with a flat-screen TV with cable channels. 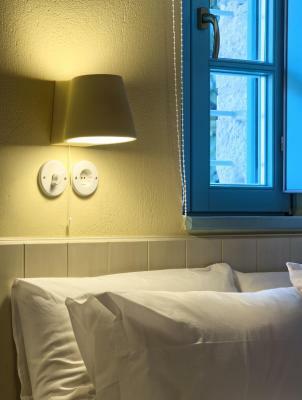 Guests will enjoy views of the village or Mitsikeli Mounatin from their windows. Most units also include a fireplace. An array of activities can be enjoyed on site or in the surroundings, including cycling and hiking. The scenic town of Ionannina is at a distance of 16 mi. This property is also rated for the best value in Asprangeloi! Guests are getting more for their money when compared to other properties in this city. When would you like to stay at Virginia? 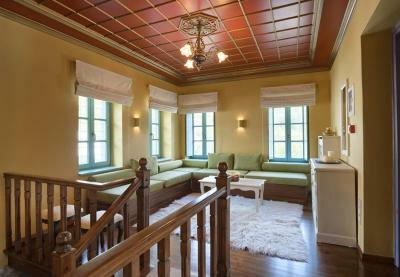 Traditionally decorated and fitted with a fireplace, this room offers mountain views from its windows. 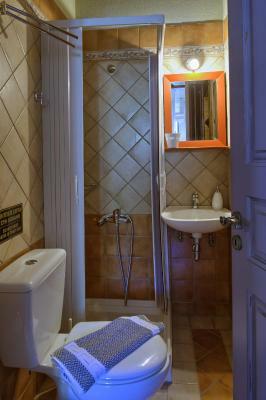 A flat-screen TV with cable channels is included. 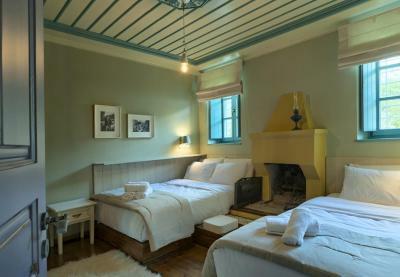 Featuring a fireplace and a flat-screen TV, this room is traditionally decorated with beamed ceilings and wooden floors. 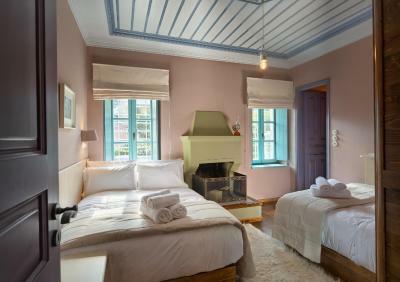 Traditionally decorated room with beamed ceilings, wooden floors and a a flat-screen TV. House Rules Virginia takes special requests – add in the next step! The only downside of the property was the the sound insulation of the room as people could be heard from outside! Nothing. Honestly ... just nothing. The hotel is in adorable small town. Virginia (the host) is super sweet and helpful. Hotel is also very cute, their restaurant is pretty good as well. Overall, I absolutely enjoyed my stay there. What have i to say? 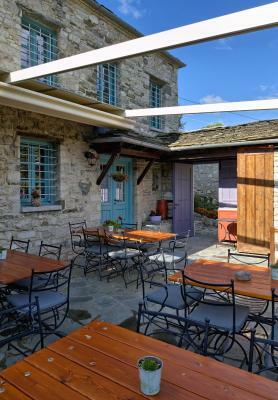 Very friendly and helpful people, great location for visiting Zagori villages, cleanliness, beautiful rooms, nice breakfast and excellent food (greens-pie is my favorite). Also Virginia the owner is an athlete herself on mountain running so you can have valuable information on various issues in the area. Virginia the owner is a charming person ! We enjoyed very much our stay here. Restaurant is special, serves traditional fresh delicious food ! Beautiful place. Thanks !! The village itself has a very deserted feel most of the time. You’ll need a car to really do much in the area. 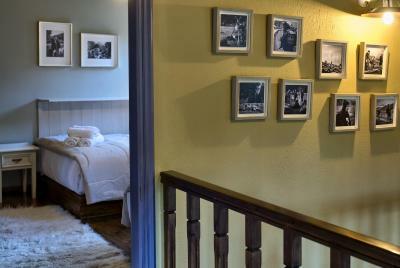 The rooms were very clean with good linen but a bit small for moving around/storing luggage. Getting into our bathroom was a bit of a squeeze too. There was a nice guest sitting area and terrace, and the chicken pie really is as good as you may have read. You can eat here for a very reasonable price. This is a family run establishment and Virginia is very warm and helpful. Virginia always with a smile makes our stay in Zagoria wonderful. 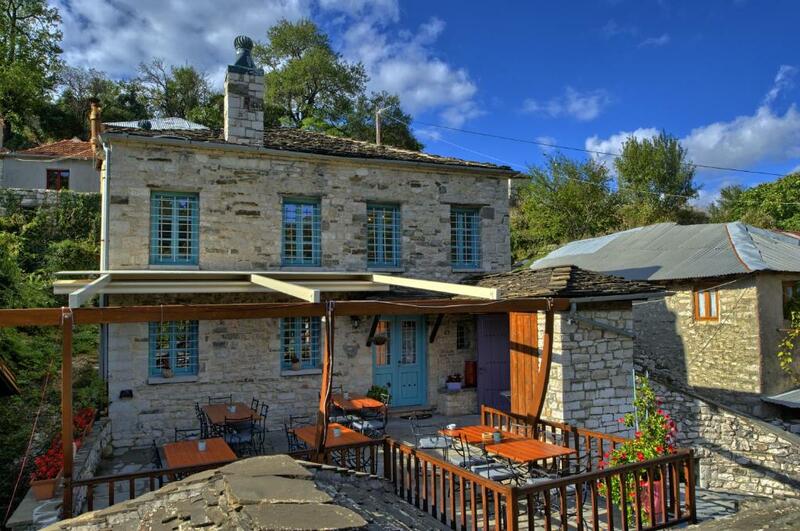 The quite village (which is not touristic as the other villages) and the beautiful house and well decorated rooms makes it relaxing and wonderful place to come to after a day trip's in Zagoria area. Thank you Virginia for everything.